Women can find themselves, through various circumstances, becoming the sole provider for their household, especially in areas of conflict. Since her husband passed away, Amina has become the head of her household with five children to care for and feed. She managed to start a small business but struggled because she could not read/write and had no numeracy education. 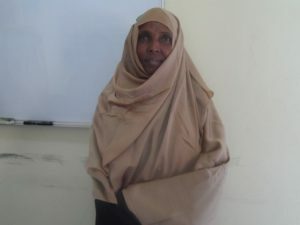 This is why our Learning for Livelihoods is geared towards women like Amina who are sole providers for their families. Women and other vulnerable individuals, who enrol in the programme, receive basic numeracy and literacy skills, business development training and vocational training in the livelihood generation activity of their choice. In partnership with Micro-Dahab, a microfinance bank and part of Dhabshiil Microfinance, women who have completed their training can then access funds to help them develop their businesses. Amina has completed her literacy and numeracy training in March of this year. She will be able to start her business development and vocational training this month, enabling her to develop her skills further. “I was a business woman and the problem I encountered was that I could not read, write and was not able to do numbering. This resulted in much of my money was easily lost or taken away by customers. I was not able to record the names of clients and the cash I owed them after they purchased something from me. We use alternative education opportunities, like these, to help those who have missed out on going to school, giving them a second chance to learn and equipping them with the skills and knowledge to build a better future for themselves and their families.